Details: Play, learn, and enjoy bluegrass at the upcoming CCM Bluegrass Band Scramble. 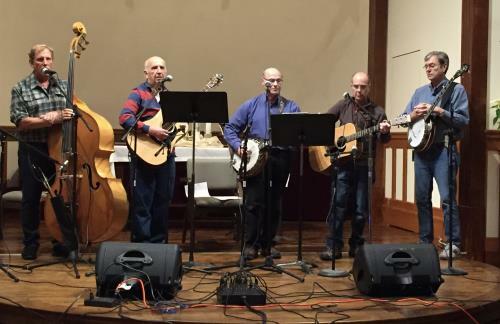 Rich Stillman, accomplished banjo player and CCM faculty member, will once again lead a fun and immersive CCM Bluegrass Band Scramble on Saturday, May 4th from 12:00 – 5:00 pm. The Scramble is ideal for anyone who dreams of playing in a band, needs some guidance, and doesn’t quite know how to begin. Or, think about joining the Scramble if you simply want to play with new musicians and hone your skills. If you can play three chords in rhythm, the Scramble is for you, and the cost is only $20 payable at the door. Sign-up individually and then meet your new bandmates. Rich will ensure each group has the instrumentalists needed to create a bluegrass band. You and your new bandmates then have a two-hour practice session with expert coaching from CCM instructors. You’ll prepare songs and stage patter for a three-song turn performed with a professional sound system for a live studio audience. Designed for pure enjoyment and no competition, the CCM Bluegrass Band Scramble provides an opportunity for musicians to meet up and perform with other musicians in the area, and then try their skills in front of other people. The May 4th Band Scramble is part of the West Concord Cultural District ArtWeek. The afternoon includes a lecture on the origins and culture of bluegrass music by musicologist and CCM Faculty member Ian Goldstein. Ian’s lecture at 3:15 pm is free and open to the public. A statewide cultural festival presented with funding from the Highland Street Foundation and produced by the Boch Center, West Concord’s ArtWeek means all things bluegrass. Proud to be part of the West Concord ArtWeek, CCM will host the unveiling of the ArtScramble at 3:45 pm. It’s sure to be an amazing piece of art that will be seen around town. And not-to-be-missed—our Bluegrass Band Scramble participants will treat everyone to a free concert at 4:00 pm.